In Part II Mr. B. Prilutsky shares with our readers treatment protocol for the management of post-concussion syndrome and prevention of post-traumatic encephalopathy. We think that the information presented in this article is very important for patients and therapists. Early massage intervention assists in quicker recovery and by balancing the autonomic system, it reduces the risk of the development of post-traumatic encephalopathy. Therapists who are able to use this protocol will help patients in great need while opening new business opportunities. To read Part I please click here. The mainstream approach to the treatment of mild to moderate concussion is “rest and time.” Water pills, pain medication and muscle relaxants are some additional tools. Partially this is true – with time and rest the immediate concussion symptoms go away. Historically, the Medical Massage protocol for post-concussion originated in a tragic accident. In 1963 the famous Soviet boxer and two-time Olympic champion, Valeri Popenchenko, collapsed 24 hours after winning the Soviet Union championship. He was diagnosed with severe concussion after the fight he just won. At that time, the “rest and time” cure was widely implemented. So Valeri was prescribed a three week rest and the immediate post-concussion symptoms indeed disappeared. However, a couple of months after the accident Valeri noticed that he couldn’t focus and every time he tried to exercise he felt very uncomfortable symptoms of palpitation, sweating and light nausea. In other words he developed the so called “exercise intolerance,” which in his case meant the end of his boxing career. At that time his physician was Professor Dembo, who was also a Soviet authority in sports medicine and massage therapy. Professor Dembo started to dig deeper. He assembled a team of colleagues and his graduate students. This group discovered that the first diagnostic biomarkers to the future development of posttraumatic encephalopathy were irregularities in the function of the autonomic nervous system. These irregularities included: constant fatigue, fluctuation in blood pressure, irregular heart rate, feelings of upset stomach, increased sweat production, etc. If after the disappearance of immediate concussion symptoms these symptoms remain, it is almost a 100% chance that the patient will later develop encephalopathy of a different degree. As soon as Professor Dembo realized this correlation, he stopped Valeri’s training and started various Medical Massage techniques trying to find the ideal combination of tools to use to activate the sensory receptors in the soft tissues as a tool to restore balance in the autonomic nervous system and help Valeri recover. Within the following six months Dembo’s team developed the entire treatment protocol for a post-concussion rehabilitation and Valeri’s condition improved tremendously. His focus was restored, he restarted his training and eventually came back to both boxing and later his own scientific career. Here is the protocol for post-concussion rehabilitation and the rules for its application. The selection of tools and techniques for Medical Massage protocol depends on the amount of time after the concussion. Immediately after concussion the major goal of the therapy is to increase the CSF movement through the glymphatic system and its drainage into the lymphatic system. Thus the treatment protocol is a combination of lymph drainage techniques and cerebral spinal fluid drainage techniques. These first two steps can be applied immediately after head trauma. Successful drainage of excessive CSF decreases the intracranial pressure with a following lessening of clinical symptoms such as nausea, headaches, blurred vision, etc. An equally important outcome of Medical Massage therapy for these patients is restoration of cerebral perfusion, which in turn prevents development of degenerative changes associated with post-traumatic encephalopathy. Attention: under normal circumstances any steps of the protocol described below shouldn’t trigger any uncomfortable reactions. However, for post-concussion patients, especially after recent trauma, some steps may trigger unpleasant autonomic reactions as increased head pressure, headache, nausea etc. If patients report any similar problems immediately decrease the intensity of therapy or cease this particular step altogether until the patient can tolerate it. Observe and use your clinical judgment. Lift the client’s head carefully with the right hand and grab the neck with the left hand so that four fingers are on one side of the neck and the thumb on its other side. 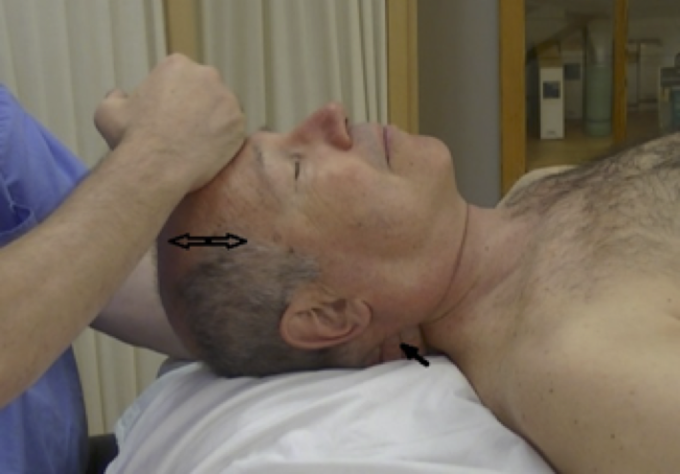 Then while continuing to hold the neck with the left hand, place the ulnar part of the right hand on the forehead along the frontal sinuses (see Fig.1). Once the hands are in position, ask the client about exhalation and apply slow repetitive pumping-like tractions along the axis of the spine. During the pumping tractions the left hand simultaneously applies repetitive neck compressions with the same frequency. Also during each traction the right hand is directing traction backward from the area of the frontal sinus toward the top of the head. The right and left hands could be switched depending on the therapist’s preference. The compression has to be applied with gradually increased pressure to the first threshold of any discomfort (see Fig. 2). Sustain this pressure on each point for approximately 15 seconds. Pressure should be combined with light manual vibration. Repeat 15 seconds of compression on all proposed areas for the next 10 minutes. 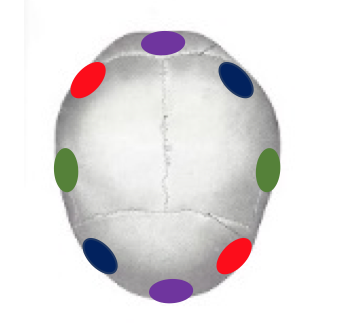 It was suggested to me by Dr. Ross Turchaninov to additionally stimulate the glymphatic system with very gentle, bi-manual repetitive compressions of the skull using soft parts of both palms. The hands are placed on the opposite sides of the head and it gently compresses 3-4 times during the client’s long, slow exhalation. Areas for hands placement are shown in Fig. 3. On numerous occasions I have incorporated this proposed technique into original Prof. Dembo’s protocol and it contributed to faster recovery. The client is positioned on the side. Adjust a towel /pillow so that the neck is well supported and leveled in a horizontal position. Place the ulnar edge of the palm closer to C1. Place four fingers of the other hand in a half grip so the fingertips are aligned in a chain. Place both hands perpendicular to the neck, next to each other. Avoid shaking, especially during the first five treatments. 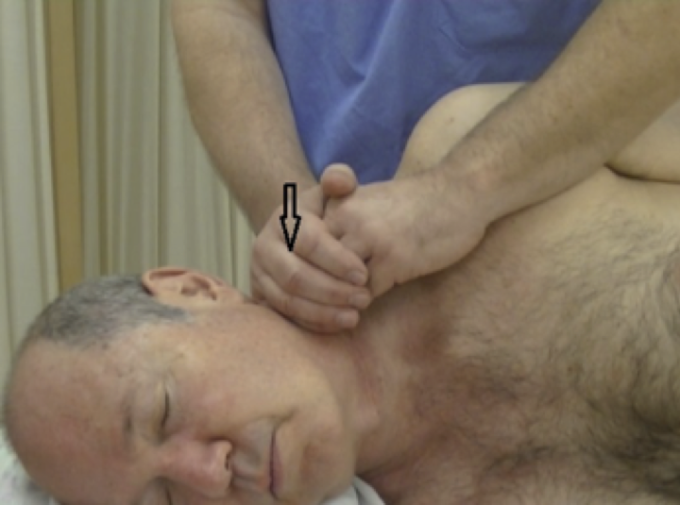 Using both hands at the same time, apply careful pumping strokes on the lateral neck (see Fig. 4). Use light pressure and be sure that each stroke has a slightly circular motion. Re-apply similar strokes along the entire lateral neck for one and a half minutes. If the patient can tolerate it, gradually increase pressure. Turn the client’s head to the other side and apply the same therapy on the opposite side of the neck. Frequently even after moderate concussion the client may feel nausea and dizziness during deep inhalation/exhalations. However, usage of the client’s active inhalation is an important tool to accelerate lymph drainage and eventually CSF drainage. This is why Thoracic Pump Technique is such an important treatment tool. During each inhalation, the diaphragm contacts and descends while additionally decreasing intra-pleural pressure. The drop in the intra-pleural pressure helps to stream air into the lungs but it also is the main driving force for lymphatic circulation. It pulls lymph through the lymphatic system, while it is cleaned in the lymphatic nodes, all the way through until clean lymph is returned into venous circulation. As we discussed in the Part I of this article, the emptied lymphatic system on the head and neck in turn allows the CSF to be drained from the brain. The client lies on his/her back. Place your hands against the sternum (see Fig. 5). Ask your client to inhale and exhale. 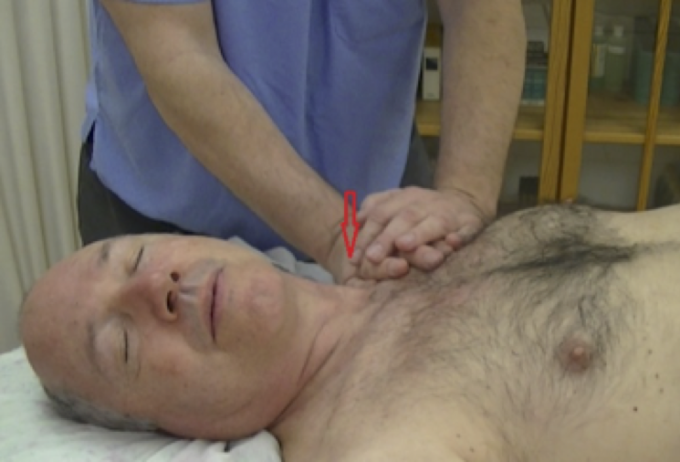 At the time of inhalation, gently resist the expansion of the rib cage applying pressure which the client should overcome while expanding his/her thoracic cage during inhalation. Release the pressure at the end of exhalation and follow the rib cage until it completely collapses before new inhalation efforts. Repeat resistance to the thoracic cage expansion 5 times. Even gentle resistance of thoracic cage expansion demands stronger contraction of the diaphragm which additionally lowers intra-pleural pressure stimulation lymph drainage and eventually CSF movement. Be sure to use Thoracic Pump Technique only after the client allows the therapist to engage active inhalations as a part of the therapy. Ask your client to turn her/his head to the right. Place your hand in the left supraclavicular area in the junction area of the thoracic duct and the brachiocephalic vein. Apply pumping strokes there trying to fit 3-4 strokes in one client’s exhalation. Repeat these techniques for 3 minutes. Ask your client to turn her/his head to the right. Place your hand in the right supraclavicular area in the junction of the right lymphatic duct and the superior vena cava. Apply pumping strokes there trying to fit 3-4 strokes in one client’s exhalation. Repeat these techniques for 3 minutes. Abdominal Pump Technique, the same way as Thoracic Pump Technique, is a very important driving force for entire lymphatic stimulation. The largest lymphatic vessels including the cisterna chyli are located on the level of the navel and application of Abdominal Pump Technique accelerates movement of the lymph into the thoracic duct and it secondarily increases CSF drainage. Make a fist and place it in the area of the navel as shown in Fig. 7. During the client’s prolonged exhalation perform gentle 3-4 pumpings with moderate pressure. Repeat Abdominal Pump technique for 3-5 minutes. The protocol presented above should be implemented during the Hypermetabolism Stage for approximately the first 7-10 sessions with total duration of each session approximately 35-40 minutes. The acceleration of CSF’s movement through the glymphatic system and increase of lymph drainage decreases the intracranial pressure and restores the arterial blood supply to the brain and its venous drainage. Thus the success of the first stage of the therapy coincides with the disappearance or significant reduction of the initial symptoms which appeared after concussion. From this point the treatment enters the second stage which now targets imbalance within the autonomic nervous system triggered by concussion. As I mentioned above this imbalance and its symptoms are a biomarker and one of the contributing factors to the development of post-traumatic encephalopathy. One of the first outcomes of Postconcussion Encephalopathy is autonomic irregularities. Unfortunately, they greatly interfere with restoration of cerebral circulation and it overall affects brain recovery from acute trauma contributing to the future development of encephalopathy. Thus, for therapists it is extremely important to understand the equal importance of acceleration of cerebral spinal fluid drainage and restoration of balance between sympathetic and parasympathetic divisions of the autonomic nervous system. I believe that such an integrative approach will help deliver quick and stable clinical results. Each session starts with toes and when working on the upper extremities the therapist should concentrate on fingers. This is the first step which affects the autonomic nervous system. Feet and hands are the most distal parts of the body from the centers (brain and heart) and they are at the very end of the capillary network which is greatly affected by the force of gravity. There are scientists who even consider feet and hands as the reflex zones of the entire cardiovascular system (Chernigovsky, 1980). Some massage modalities like Pericardic Massage are based on this fact (Akmedzhanov et al., 1981). The usual duration of a full body massage session is 45 minutes. The CSF and Lymph drainage techniques should be continued, but their application should be shortened to 15 minutes. Thus, one hour therapy should include initial application of CSF and Lymph Drainage techniques for 15 minutes, followed by the addition of full body massage for 45 minutes. Professor Dembo detected that irregularities in the function of the autonomic nervous system are biomarkers for the future development of post traumatic encephalopathy and proposed treatment options based on application of massage therapy. Dosed Physical Exersises in Patients Who had Myocardial Infarction. Vopr. Kurortol. Fizioter. Lech. F iz. Kult., 4:21-23,1981. Chernigovsky, V.N. : Interoreceptors. “Medicine”, Moscow, 1980. Females. Advan. In Nurs. Scien., July: 44-61, 1982. Mutch WA, Ellis MJ, Graham MR, Wourms V, Raban R, Fisher JA, Mikulis D, Leiter J, Ryner L. Brain MRI CO2 Stress Testing: A Pilot Study in Patients with Concussion PLoS One. 2014 Jul 17;9(7):e102181. Blumbergs PC, Scott G, Manavis J, Wainwright H, Simpson DA, McLean AJ. Staining of amyloid precursor protein to study axonal damage in mild head injury. Lancet. 1994;344:1055–1056. Tau-mediated neurodegeneration in Alzheimer’s disease and related disorders,” by Carlo Ballatorre, Virginia M.-Y. Lee, and John Q. Trojanowski, Nature Reviews Neuroscience 2007 Vol 8 (9), Sept: 663-72.